According to Aberdeen Group, 1/3rd of midsized companies rely on technology to streamline and accelerate processes and companies who are using modern ERP systems are able to increase on-time deliveries by 24%. Thought the usage of ERP software by the organizations is growing because of the ease of planning it provides, few factors need to be considered before its implementation. The 3 key components of effective ERP implementation are people, process and technology. One of the ways how organizations can harness the full potential of this software is by educating and training the end-users. The training should address learner’s apprehensions, clarify the roles and responsibilities and use the software in a hassle-free manner. Want to know more about how training the end users can make ERP implementation more effective? 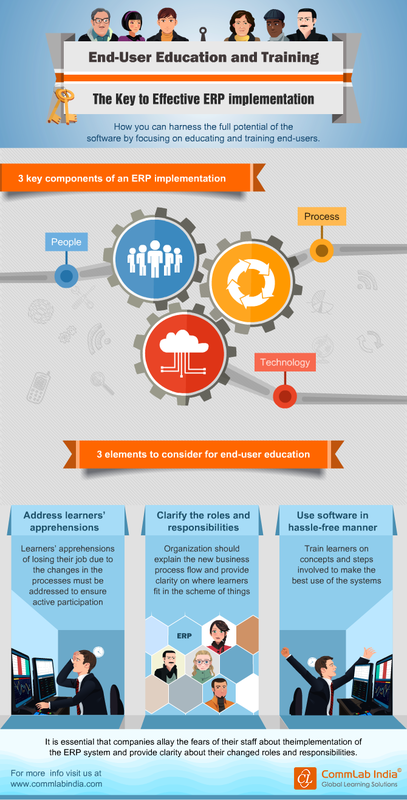 Check out the Infographic End-user Education and Training – The Key to Effective ERP Implementation for more information.